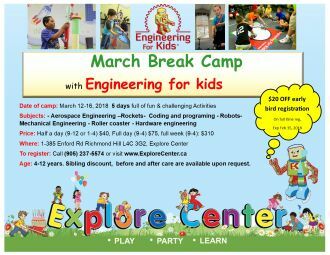 We run an amazing, fun and creative March break camp with the cooperation of "Engineering for Kids". The goal of this camp is to help children improve critical thinking and problem-solving skills. Each program is designed to offer an exciting, HANDS-ON experience that encourages collaboration and teamwork among kids. The camp is suitable for ages 4-12 years old. Before and after care is available upon request. Early bird discount: Register before February 15 and receive $20 off. Sibling get 5% off. Nothing to do this winter break? We got plan to keep your kids busy!